My Child is Starting Kindergarten! Tips for Getting Ready. Your firstborn just graduated from preschool, or maybe is going directly into elementary school from home. During this exciting time, here are some tips that I wish I’d known. 1) The week before school, plan to stay in town. It’s important that your child is not jet lagged or tired from travel. Start waking your child in time for school at least a week before school starts, longer if it’s much earlier than you’re used to. Be sure to stop by the school this week, as schools have an in service week for teachers to prepare, and ask to meet your teacher. Many schools have an orientation for kindergarteners, which your child would attend to accomplish this. Don’t wait until the last day! 2) The first week of school is exhausting for new kids. Even with multiple recesses and snacks, kids must meet higher expectations. They must be quiet indoors – for instance during lunch, they can talk but quietly. The day feels long even to children used to a full day in preschool as there is much less free time and much more sitting still and being quiet. So, don’t schedule anything after school the first week or two. If possible with your work schedule, wait a week to start aftercare so that your child can come home and play. Try to do drop off yourself so that you can meet the teachers. 3) The first day of school, dress your child comfortably. If you have a girl, be sure she wears shorts under skirts or dresses (for monkey bars) and wears shoes suitable for exercise. If you have an active child, plan exercise before school, whether that’s walking or cycling to school or playing on the school playground. 4) Volunteer as a way to get to know the school and PTA parents, who might be “in the know”. Our school uses parents to help at lunch and recess. If your job allows this flexibility, you see the children and gain insight on what your child is doing. Open a small carton of milk. Eat independently while sitting properly and not fighting with friends or siblings. Go to the bathroom independently, including wiping, buttons and snaps. Practice using an indoor voice. Carry his own backpack and put in his cubby or on his hook. 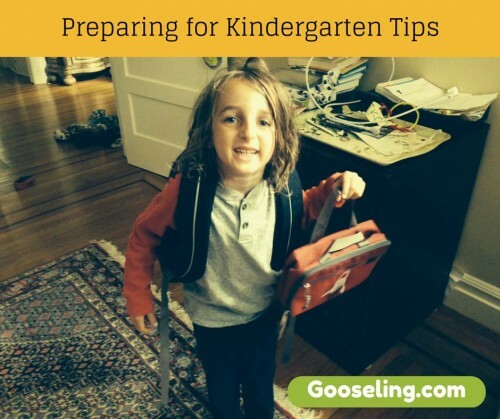 What are your tips and experiences from preparing for kindergarten? 1. Getting used to the mechanics of eating lunches in the same way as the child will eat, I.e., opening snack containers, replacing kids when done, eating within a set time frame that’s the same as the allocated lunchtime at school. 2. Showing up at pick up with extra food /snack, in case the child didn’t finish lunch or is running low on energy. 3. Asking your child’s teacher whether the teacher might like extra snacks for kids who may need one.